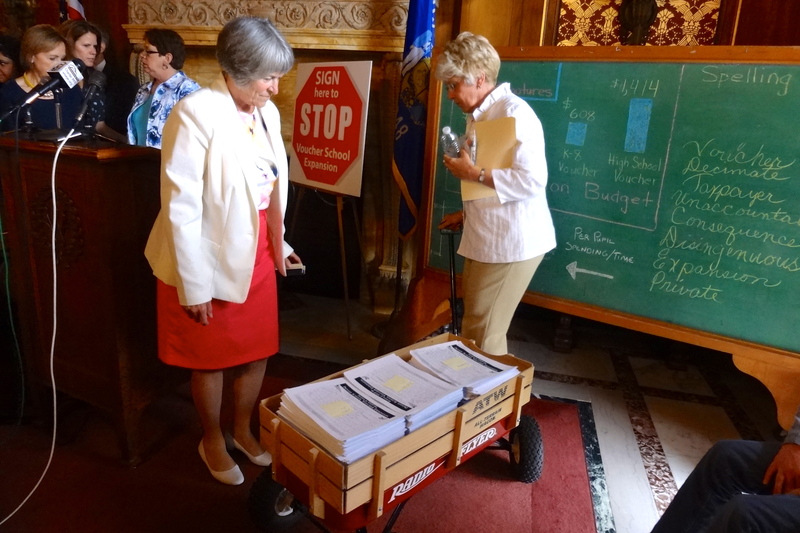 Rep. Janet Ringhand (D-Janesville) and Rep. Sondy Pope (D-Middleton) with a wagon full of 16,809 signatures. Earlier today a group of legislators and public school advocates delivered a wagon load of petitions to Governor Scott Walker and the Co-chairs of the Joint Finance Committee urging them to remove school voucher expansion plans from the 2013-2015 state budget. They also called on the Joint Finance Committee to increase the Governor’s proposed funding of public schools by $275 per student. Senate Minority Leader Chris Larson (D-Milwaukee) discussed the relatively poor performance of private schools that receive public education dollars and stressed the importance of supporting public schools for all children. Beloit School District Superintendent Steve McNeal explained that his district had already cut to the bone, eliminating 110 positions and cutting their budget by $22 million. He stressed the importance of maintaining funding for school districts with high levels of poverty. Rep. Chris Taylor (D-Madison) introduced Crestwood Elementary School student Lydia Oakleaf who worried about the cuts in programs if state education aids aren’t increased. Denise Gaumer Hutchison blasted the idea that Green Bay schools are failing and urged the Joint Finance Committee to reject voucher expansion and restore funding. Mary Swifka, a mother of a special needs student, explained how Special Needs Vouchers are particularly harmful because they reduce resources for the most needy students, and leave families whose children are in private schools using voucher funds without the legal safeguards available to public school families. When asked by Associated Press reporter Scott Bauer if Democrats were ready to compromise on vouchers if their funding request was granted, Rep. Sondy Pope unequivocally answered no. The Joint Finance Committee will likely take up the voucher and per-pupil funding of public schools at their final meeting on June 4.